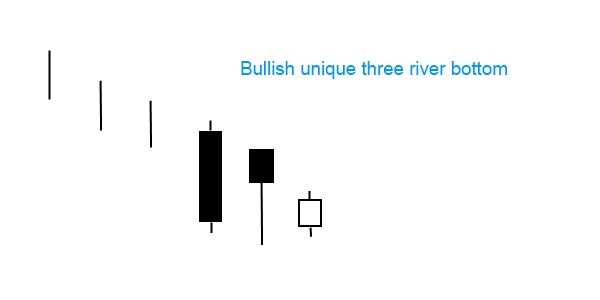 The bullish unique three river bottom is a bullish reversal three-line pattern. It forms in a down trend and starts with a long black candlestick on the first day that often closes at a new low. The second day is also black; a smaller candle with a long lower shadow appears. The body of this candle is completely engulfed by the first candle. On the third day a small white candle forms that closes below the second candle. This complex pattern first indicates market uncertainty and then a bullish market reversal. It appears extremely rarely on the candlestick charts. It somewhat looks like the bullish morning star.